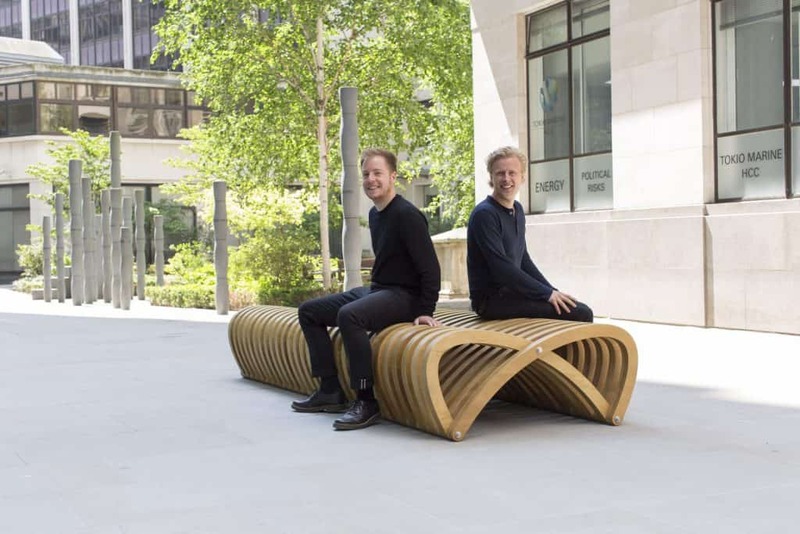 The London Festival of Architecture has unveiled a series of new one-off public benches, designed by emerging architects and designers, and installed in partnership with the City of London Corporation and Cheapside Business Alliance as the City of London features as a focus area for this year’s London Festival of Architecture. 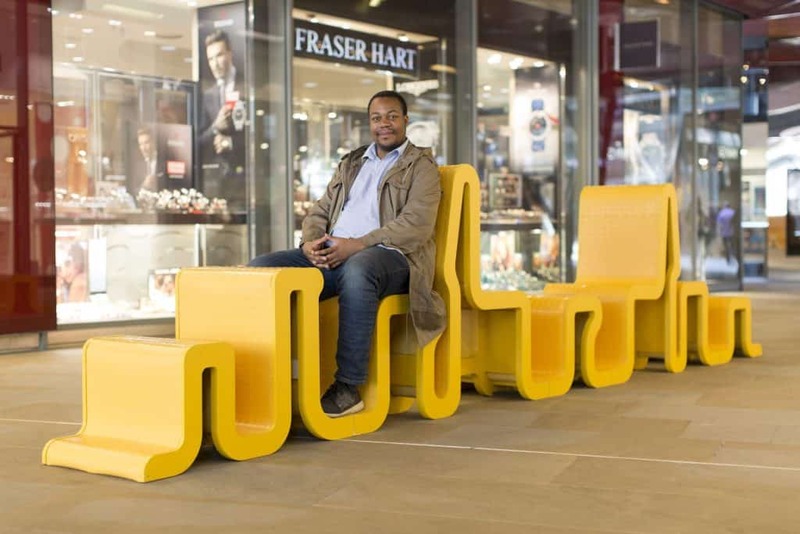 Across the Thames, a further bench has been installed outside London Bridge station in partnership with Team London Bridge, at the heart of another of the festival’s 2018 focus areas. 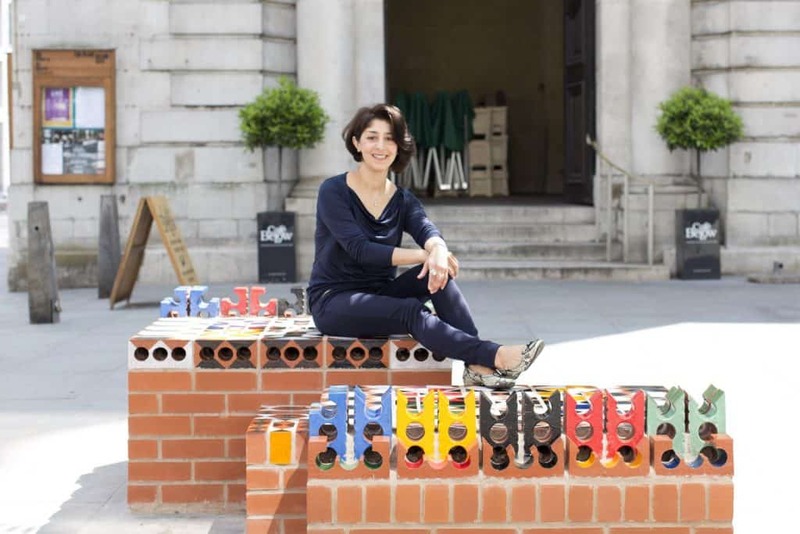 Architecture and design students, recent graduates and emerging practices from across London were invited to submit a bench design to enliven the city’s public realm. 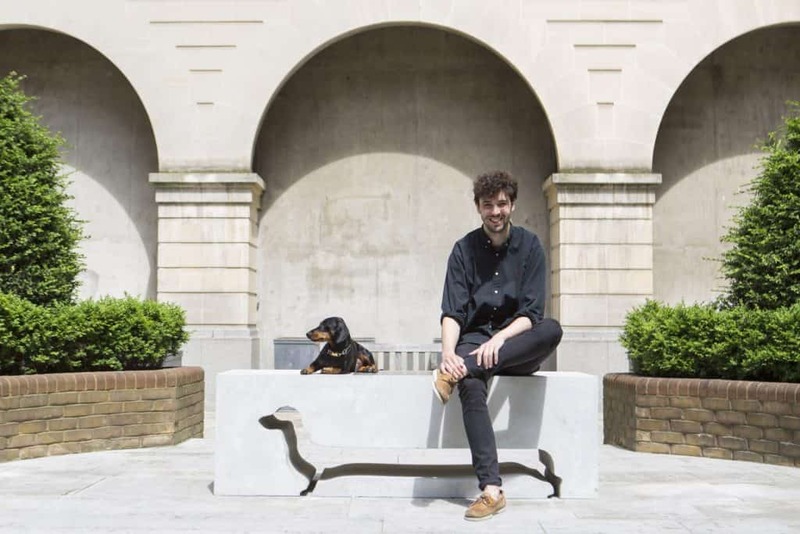 The new benches showcase London’s brilliant emerging architects and designers, and are a public gift that help the City remain an exceptional place to live, work and visit. All photos are by Agnese Sanvito. Geoffrey Barkington was a Square Mile dog whose final resting place is within Jubilee Gardens, Houndsditch. 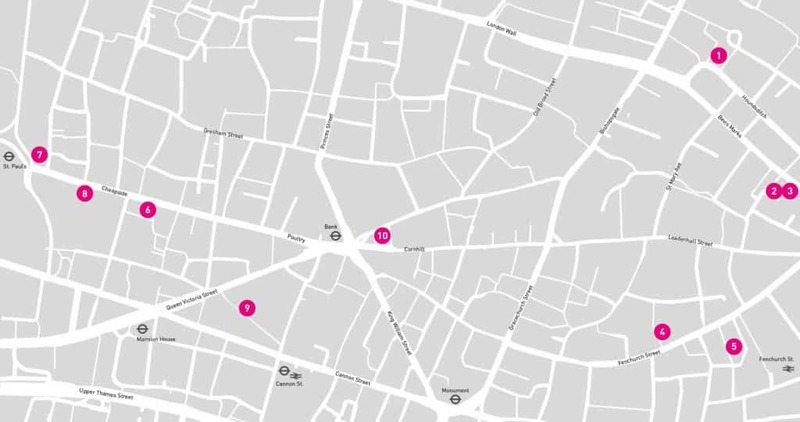 Houndsditch marks the route of a ditch outside part of the London Wall, first dug in Roman times, and known for the disposal of deceased dogs. Several dog skeletons were discovered here in 1989 during construction works. Geoffrey’s gravestone was made with the help of Solid Geometry, Tarmac, Kilnbridge, University of Westminster and Prewett Bizley Architects. The City of London is the financial heart of Britain, one of the major finance hubs on the globe and home of the London Stock Exchange. Drawing inspiration from the graphic language of stock charts, the design refers to undulating graphs of green and red bars representing profit and loss. The two benches complement each other in a yin and yang-like relationship: green becomes red, profit turns into loss. The simple, one-dimensional chart becomes interpretable, depending on the view point. Double Bench is made from a series of repeatable timber curves that are threaded onto steel bars and screwed tightly together at each end. 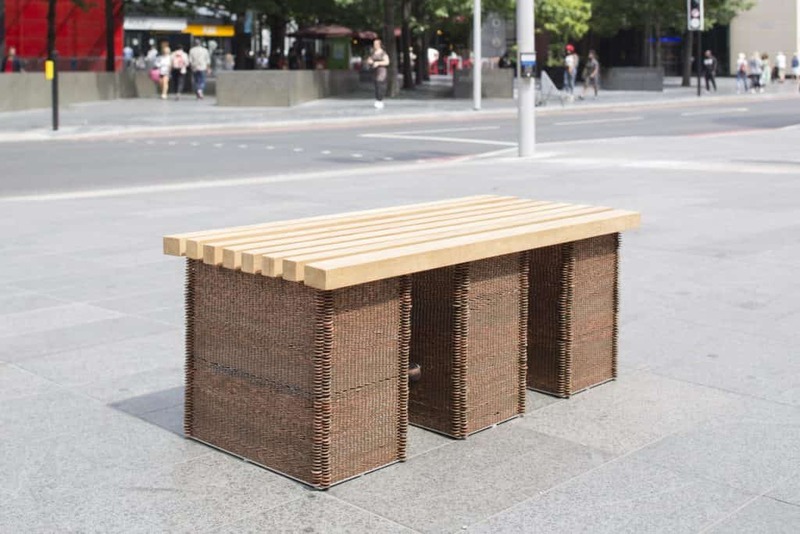 This dry-construction technique is used to make the bench easy to assemble whilst ensuring it can be dismantled and flat-packed with ease. The bench can be made as long or as short as desired, depending on where it is located, and its organic silhouette follows the natural curve of the human body. Monarch Joinery Ltd built the bench from timber supplied by James Latham. 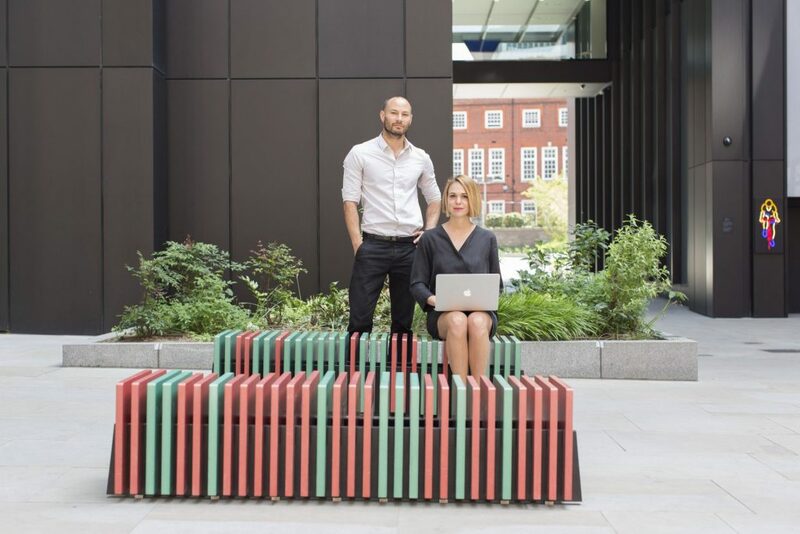 The colours and patterns of the bench reflect the history of the site and are inspired by the multi-layered context of the City of London that has for centuries been a place for trade, exchange and religious diversity. Designed in various heights, the bench offers flexible seating to rest and work.The bench is constructed from standard clay bricks that have been crafted and glazed, creating a long-lasting, maintenance-free surface. Built with generous support from Wienerberger UK and Swift Brickwork Contractors Ltd. The City of London has a long history of courtyard gardens from Postman’s Park to the Cleary Garden. The Garden Bench draws inspiration from this heritage. It is formed of eight platforms of differing height, arranged to create private pockets for contemplation and adjacencies for conversation. The materials have been chosen for their tactile as well as visual qualities with the plants – camomile, lavender and thyme – adding a further sensory dimension. The bench holds in its folded shape the memory and much-loved comforts of home furniture. Reminiscent of your comfy sofa where you cuddled up with a beloved dog, or birthday parties in the dining room, or even the naughty step. Finished in classic Nora® studded rubber on a plywood frame, the bright yellow bench has something for everyone, poetically and ergonomically. It is imagined as a linear public place getting longer and longer, extending down the pavement and all around the city. Lighting Design by Inessa Demidova. 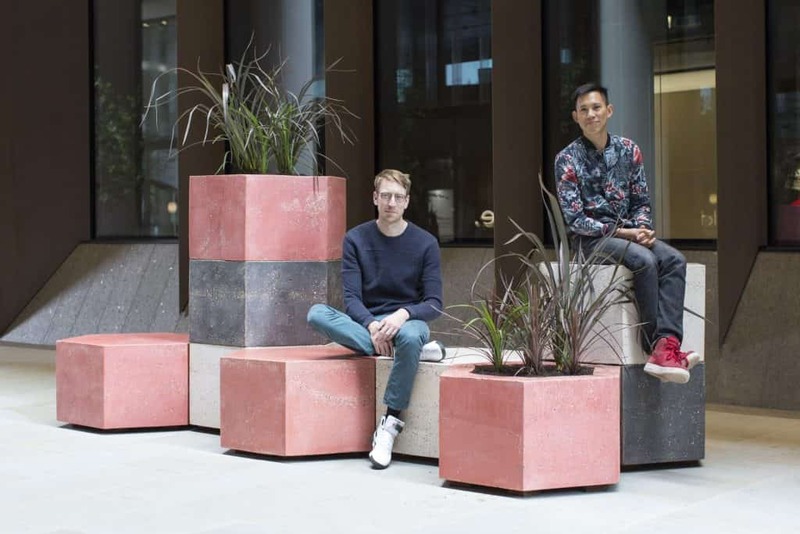 The bench takes inspiration from the majestic natural rock formations of the Giant’s Causeway, which reflects the enduring and established nature of the City of London in its ability to withstand the test of time. The rugged symmetry allows for an infinite combination of components to suit the needs of the space and draw people in exploring the tessellated landscapes created. Its recycled plastic terrazzo offers a softer yet durable contrast to the glass, concrete and steel of the city. The bench is directly inspired by the rich history of the area. The design takes the opportunity to revive some of this history and celebrate the buildings that took part in shaping it into the vibrant city district it is today. 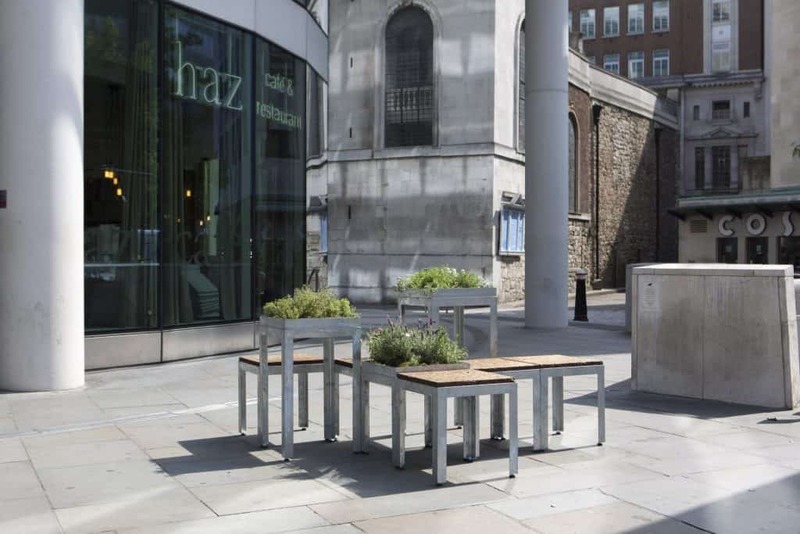 East India House and the little shopfronts along Leadenhall Street have since been demolished, but through the Ghost Bench these memories become part of the city streetscape once more. Special thanks to Architecture Initiative for the support and FP McCann for their expertise and help with the casting process. Money Box is a bench formed of 45000 penny coins stacked vertically to form 3 monolithic plinths. 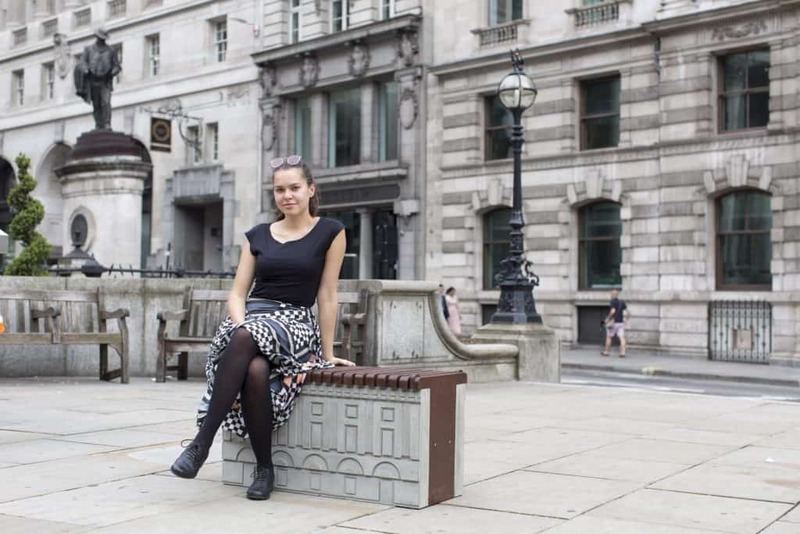 Money Box has been inspired by its context in the heart of the City and aims to challenge our perception of physical currency during uncertain economic times. As financial institutions struggle to control the growth of the digital economy, Money Box provides an outlet to spend our hard earned cash.’ With thanks to Constructive & Co for their wisdom and woodworking magic. Thanks also to our friends who have helped build the bench, penny by penny. The City Benches project was judged by an expert panel comprising Pooja Agrawal (senior project officer, Greater London Authority), Katy Ghahremani (partner, Make Architects), Simon Glynn (assistant director, City Public Realm), Ellie Stathaki (architecture editor, Wallpaper*) and Tamsie Thomson (director, London Festival of Architecture).